Preheat the oven to 375° Grease a 9×13” baking dish and set aside. In another mixing bowl, beat the eggs. Whisk in the honey and whole milk. Pour the wet ingredients into the dry, using a wooden spoon to combine until just incorporated. Fold in the melted butter and cheddar cheese. Pour the batter into the prepared baking dish. Bake for 15 minutes until golden and cooked through. Cut the cornbread into squares and serve warm or at room temperature with the chili. Heat a large, heavy-bottom pot or Dutch oven over medium heat. Add enough olive oil to just coat the bottom. Once the oil is hot, add the ground turkey breast. Season with a pinch of salt. Let it brown on all sides, using a wooden spoon to break apart the meat into small pieces as it cooks. Transfer the ground turkey breast to a plate. Once all the turkey and juices are out of the pot, add a little bit more olive oil. Toss in the sliced red onions. Let cook for 5 minutes, stirring often. Add the red peppers and red fresno chili peppers. Season with a pinch of salt. Let sauté for another few minutes. Add the turkey back in and stir in the spices. Cook for another minute. Pour in the tomatoes and chicken stock, stirring well. Bring the liquid to a boil. Reduce the heat to medium-low and cover the pot, leaving a little crack on one side. Simmer for 15 minutes, stirring occasionally. Remove the lid and continue to simmer the chili for another 15 minutes. Reduce the heat to low and finish simmering for 10 more minutes. Stir in the white beans and lime juice at the very end. Let the beans heat through. 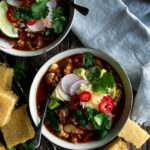 Serve the chili with shredded cheddar cheese, diced avocado, shaved radishes, more sliced red fresno chili peppers (if you like extra heat), and cilantro leaves on top. This dish gets even better as it sits, so even if I’m just cooking for 1-2 people, I like to make the entire batch and heat it up for leftovers all week long! Just add the garnishes right before you eat it.